Posted by skyvu on Tuesday, August 7, 2018 in Accounts Payable, News, Procurement. Vanderbilt Finance has introduced an updated process for confirming that goods/services have been received, effective August 6, 2018. The purpose of this change is to provide a consistent process for non-catalog purchases with increased departmental visibility and control over payment of the related invoices. 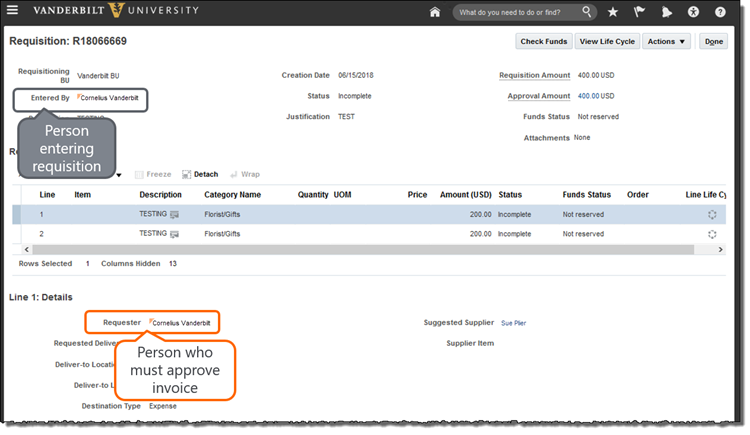 Procurement Requesters will now be notified (via both email and notification bell in Oracle) when an invoice is received for goods or services that they requested via a non-catalog order. Following notification, the Procurement Requester will either click Approve that the invoice is ready to be paid or click Reject if it has been sent in error so that Purchasing & Payment Services can resolve the issue with the supplier. This replaces the process of receiving via the My Receipts module to acknowledge that certain types of orders of goods or services are received. Demonstration: The new invoice approval process was demonstrated in the Procure-to-Pay User Group webinar on Friday, August 3rd. A recording of that webinar is available here. Interactive Training: An online module titled Oracle Cloud Procurement: Approving Invoices for Payment is available in the SkyVU Learning Program: Training for Procurement Requesters curriculum in the Learning Exchange. When preparing a requisition, be sure to indicate the person who should confirm receipt of the item and approve the invoice is listed as the Requester on the requisition line(s). The PO number will be listed for each of the Invoice Lines – to review additional details, the Procurement Requester should search for the PO in the Manage Requisitions screen in Oracle Cloud. The invoice image will be included as an Attachment with the notification and can also be viewed through the Requisition Life Cycle in Oracle. Enter any Comments needed – note that you should always enter a comment when rejecting in order to provide information to the invoice processing team in Payment Services. Approve or Reject payment of the invoice. Approving the invoice will place it into the payment queue in accordance with the terms set forth with the supplier. Rejecting the invoice will return it to Payment Services for follow up with the supplier. Who can do this when I am out of the office? Procurement Requesters can delegate invoice approval to another Procurement Requester while out of the office. Please refer to the FAQ on setting a vacation delegate for instructions and select Financial transactions to delegate invoice approvals.